I am excited to share with you all that another goal in our investing journey has been reached: I am now maxing out my 401K! If you had advised me to max out my 401K account a few years ago, I would have given you a dirty look and said something like "how the hell am I supposed to come up with $17,500 a year to invest into my 401K? I'm barely making ends meet!" 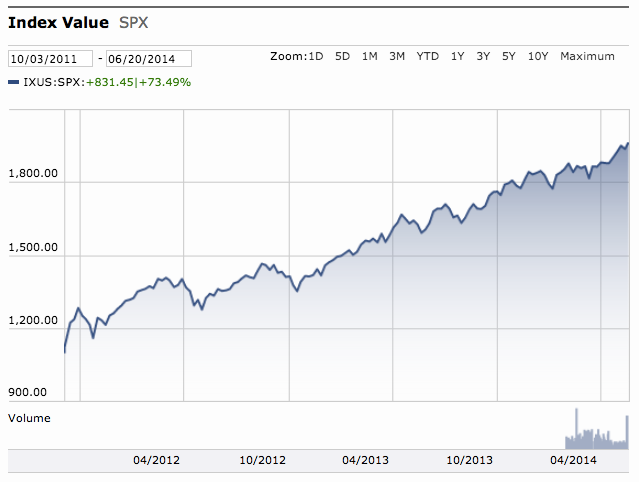 I first started investing in my company 401K on October 1st, 2011 - the first day it was offered. Since my company offered a 3% match on my contributions, I knew I wanted to invest at least 3% of each paycheck. I was anxious to start saving for retirement, but I had no idea what to invest in. The HR department handed me a list of mutual fund investments to choose from, with a Target Date fund set as default. At the time, I had a “financial advisor” and I asked him which investment I should choose. I said "what about this 'aggressive' option?” And he said "sure that sounds fine." I didn’t think much about it because I was just glad to be investing in another tax advantaged account besides my Roth IRA. Aggressive sounded like a good description for an investment choice. It turned out that the aggressive option was terrible. My investments were getting sliced and diced up into 19 different funds, all with high expense ratios (fees). Ugh. The aggressive option invested in everything from cash to emerging markets to real estate investment trusts to domestic and international stock and bond index funds. I was making money (who wasn’t making money investing in the last 5 years?! ), but the fees were really eating up my profits. Once I learned a lot more about the Bogleheads philosophy of investing, I immediately simplified my portfolio into 3 index funds mimicking Vanguard's total stock market (VTSAX) index fund. I went to the Bogleheads forum to help get advice on choosing low cost index funds to invest in. I consistently get paid two times a month and this helps me dollar cost average my investment contributions all year long. When the stock market is up, I purchase less shares; when the stock market is down, I get to purchase more shares. Once I got comfortable with my investment selection, I adjusted my contribution percentage to 10% of my salary. Every few months, I slowly increased my contributions, 1% to 2% at a time. With every salary increase or bonus earned, I steadily increased my 401K contribution amount. I went from 10% to 11% to 12% and so on. Studies consistently find that once you set up an automatic investment into a 401K, you are unlikely to cancel the changes - you are too lazy to take the time to change it! I made small increases in contributions because I knew that real permanent change takes time. I knew that if I slowly and steadily increased my investment contributions slightly every few months, I would not notice much significant difference in my paychecks. We easily adjusted to balancing our finances with a smaller paycheck. Last week I decided it was time to set my contributions to max out my 401K for the first time in my career! I've been working towards this goal since October 2011 and I am finally on track to meet it! When it comes to maxing out your 401K, just thinking about investing $1458 per month ($17,500/12) can be overwhelming. Not everyone is in a financial position to be able to fully maximize their 401K. Housing expenses, student loans, fuel, bills, entertainment, shopping, and food costs can all add up quickly. In our case, we decided to adopt Mustachiansm. This helped us cut out ALL unnecessary expenses and motivated us to increase our side hustles. This helped our savings rate increase dramatically, allowing us to invest much more into our future. Many people spend all the money that comes their way. Investing in a 401K is a great way to hide money you may otherwise waste into an account saving for your future. Setting aside $17,500 per year sounds like a lot of money to invest, especially if you are just starting your career. Take it 1% at a time and you’ll be surprised at how much you can contribute to your 401K. You won't even notice the reduction in your paycheck since the change will be gradual. All the money you invest now will go towards funding your future and your freedom. If you are under 50, you can contribute up to $17,500 a year into your 401K / 403B accounts (If you are over 50, you can contribute an extra $5,500 a year). This breaks down into contributing $1458.33 every month, or $729.17 twice a month. Your $17,500 contribution limit does NOT include money from an employer match contribution. Maxing out my 401K is a great accomplishment for us, but our retirement goals don’t stop there. We will continue to max out both of our Roth IRA contributions. My wife is currently not yet eligible for making contributions into her 401K at her new place of employment. The money from her previous 401K is temporarily sitting in a separate Vanguard holding account. Once my wife is eligible to contribute to her 401K, we will have to decide whether she will contribute into her 401K, or whether we should increase contributions into our taxable investment account. My wife’s new company currently does not offer any 401K matching, so that is kind of a bummer. We are leaning towards putting 10% of my wife’s salary into her 401K and more money into our taxable account so that we can withdrawal these funds without penalty before we turn age 59.5. We have also been steadily saving up money towards the purchase of our first rental property. Where are you at with your retirement contributions? I think it’s time to increase your contribution amount.